With such great source material, you'd have to work hard to mess up a Michael Morpurgo novel. But WildChild Productions treat his 1999 book with the respect it deserves, perfectly capturing the familial love, sea-faring adventure and friendship the story embodies. When his unemployed parents decide to use their redundancy money to buy a yacht, life for 11-year-old Michael is turned upside down. No more school, no more critical granny telling them all their plans will 'never work'. Instead, Michael's view of the world expands in ways he could never have imagined: both geographically and emotionally. Visiting Africa, South America and Australia on their travels, Michael, his parents and trusty dog Stella Artois are a tightly-bonded unit – so when the young boy falls overboard and wakes up on a desert island, we feel their collective sense of loss. With Stella to chat to (an ably-handled puppet), we can hear Michael's innermost thoughts, which are surprisingly perky given the circumstances. But it is his connection with Kensuke, an elderly Japanese man resident on the island for 40 years, that really brings the show alive. 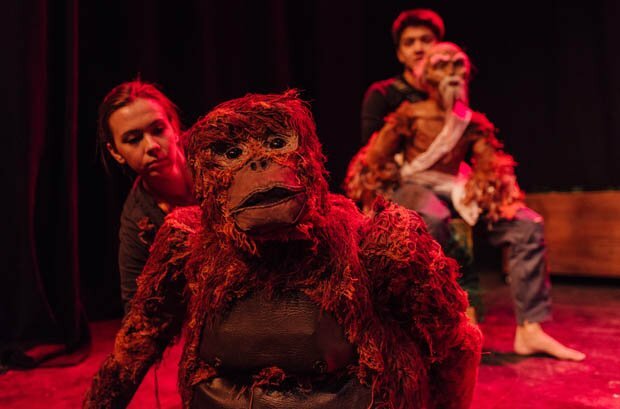 Like Stella, and two gorgeous orangutans, Kensuke is played by a puppet, which somehow gives the character even more emotional resonance. As Kensuke teaches Michael to fish, paint and look after the orangutans when a ship-load of poachers arrives, their relationship blossoms. Which means, in true Morpurgo style, you're reaching for the tissues in the last two scenes (no spoilers here, for those who haven't read the book). As with many Fringe shows, the set of sails, pulleys and foliage could do with more room to breathe, as could the action. But when a show's heart is firmly in the right place, none of that matters. Pleasance Courtyard, until 27 Aug (not 13), £8.50–£11 (£7.50–£10).